Chester County's sixty-one mushroom farms are responsible for over 400 million pounds of mushrooms valued at $365 million. But a grittier agricultural industry dominates the region: mushrooms. Kennett Square is king of fresh, commercially-grown mushrooms. Not only is mushroom farming the leading agricultural pursuit in Chester County, the area is also the largest producer of fresh mushrooms in the United States. Chester County’s 61 mushroom farms account for 47 percent of total U.S. mushroom production, according to Pennsylvania’s Agricultural Development Council. This means over 400 million pounds of mushrooms valued at $365 million, with an overall contribution to the local economy of an estimated $2.7 billion. The industry directly employs almost 10,000 workers, mostly from the area’s large Hispanic community. Chester County produces over 400 million pounds of mushrooms valued at $365 million. 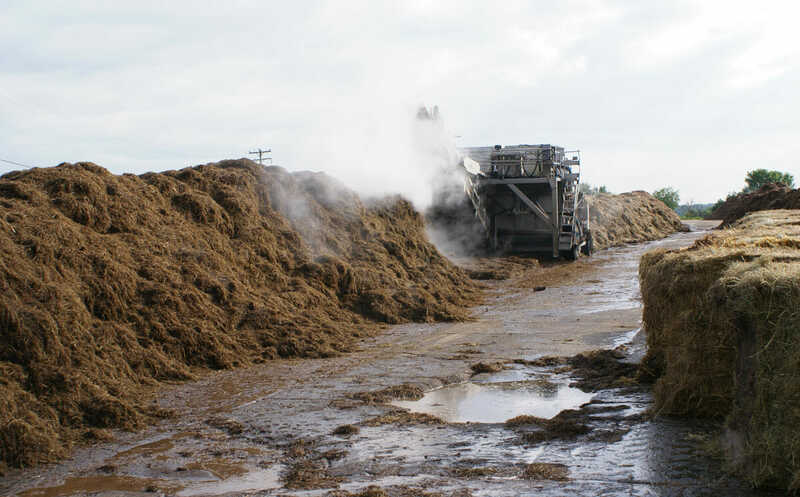 Machines turn rotting hay to make compost. Mushroom barns are called houses or doubles. Fresh-mushroom production is both labor-intensive and mechanized. Compost, once made from horse manure, now begins as hay spread on concrete slabs. Nitrogen is added, and the compost is turned for several days until it is a steamy, smelly mass. It is then transported to mushroom houses, spread on growing racks and pasteurized before the delicate, disease-prone spawn are planted and topped with peat moss, limestone and water. A few weeks later, tightly clustered mushrooms start to appear. 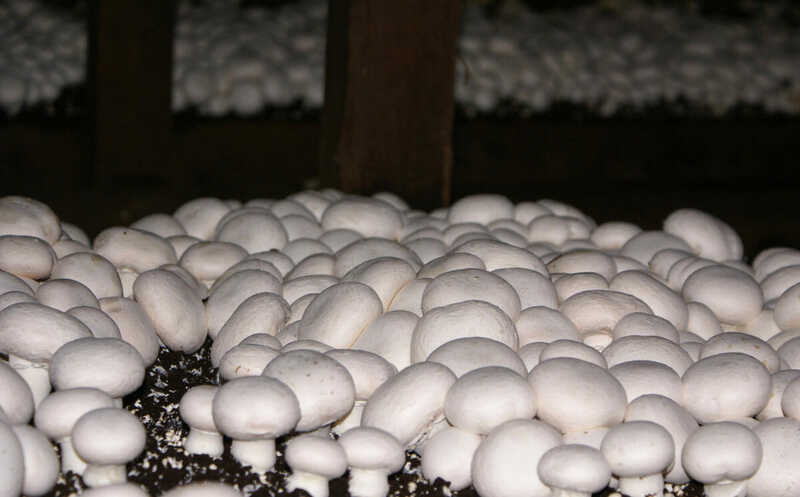 About 10 or 11 weeks after a crop is sown, mushrooms are hand harvested over a period of several days. Crews start picking as early as 4 a.m., and the mushrooms are rushed to modern processing centers. “Within about 30 minutes of arrival, the mushrooms are cooled to 34 degrees,” explains Angelucci, and by that evening they are cleaned, packaged and on their way in refrigerated trucks to markets across the country. “Our biggest customer is Costco,” says Charles Cardile, who, with his brother Matt, runs C&M Mushrooms, founded by their grandfather Salvatore, who emigrated from Sicily in the 1920’s. Mushroom growing started regionally in the 1890s as an adjunct business for greenhouse owners who sold fresh flowers to Philadelphia. 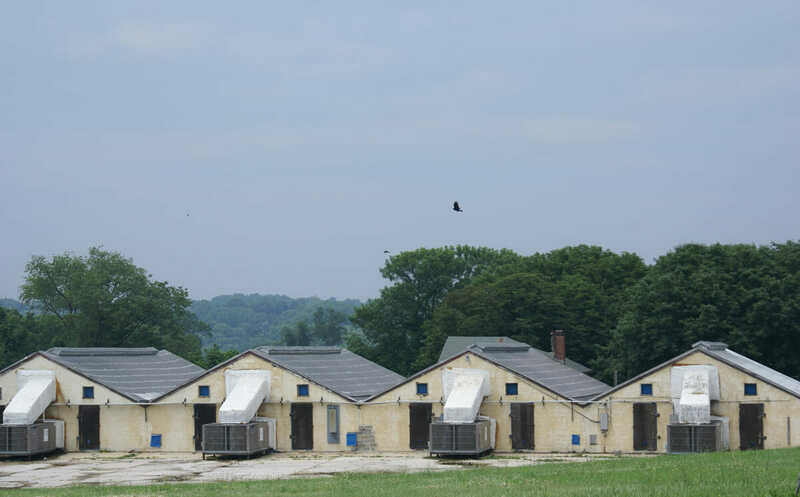 Nearby horse farms and race tracks supplied manure for compost. Mushrooms were an attractive crop to the thousands of Italian families who migrated to the area in the first quarter of the last century, a population used to foraging wild mushrooms, and today many mushroom companies are owned by second-to-fourth-generation Italians. 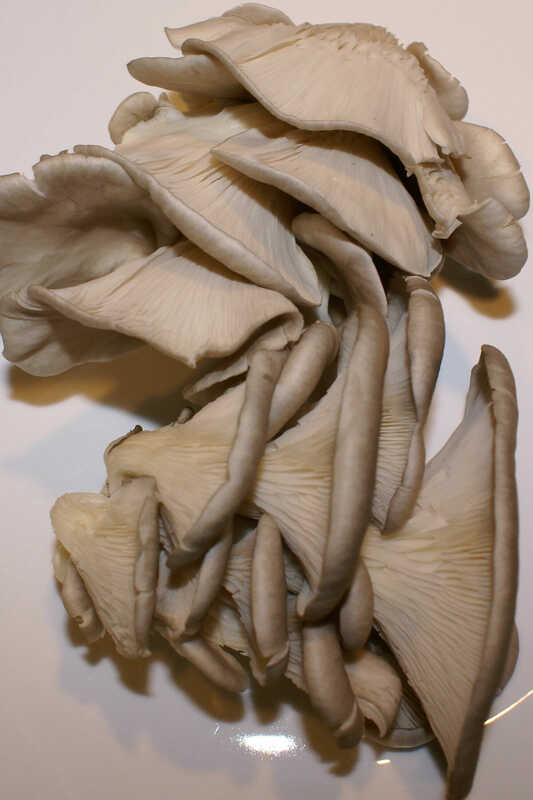 Oyster mushrooms are referred to as exotics. 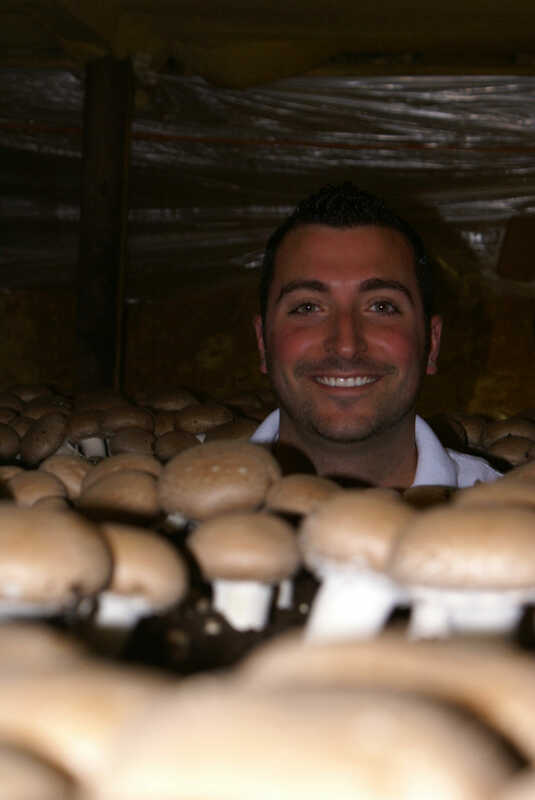 Grower Charles Cardile in mushroom house with criminis. “We used to only harvest three crops a year” a generation ago, recalls Fred Recchiuti of Basciani Mushrooms. “We shut down for most of the summer, and the people around here rented three blocks of beach at Wildwood, New Jersey.” No more ”“ today, mushroom growing is a 24/7/365 operation with four to six crops produced annually. Alex Vergara picked mushrooms for four years before becoming a supervisor at To-Jo Mushrooms in Avondale. “The most important thing is knowing when a mushroom is ready to pick, according to its size,” says Vergara. Harvesters learn to select those mushrooms that may only be a half-inch smaller or larger than those around it, according to customer preferences. “I got it right away,” he says, “but not everyone does.” Vergara adds that he could harvest between 80 and 100 pounds per hour as a picker. Today, mushroom growing is a 24/7/365 operation with four to six crops produced annually. Most canned and other processed mushroom products are imported, but a new marketing program is driving use of mushroom pieces and lower grades to blend with protein in institutional and school-lunch programs. “Mushrooms are high in nutrition and have less calories and fat than meats,” says Kathleen Preis, who heads marketing for the Mushroom Council. “The biggest problem we face today is finding labor,” says Laura Phelps of the American Mushroom Institute, the industry’s Washington-based lobbying group, and indeed, a few mushroom houses are being replaced by mechanized growing warehouses, although mechanical harvesting results in more wasted product. Additionally, the industry’s local expansion has been contested by public resistance to its odors, water usage and compost disposal issues. In spite of these challenges, Kennett’s mushroom industry continues to thrive ”“ even if its success smells anything but sweet. I want to subscribe to your mushroom newsletter as a modern farmer. Kindly enrol me as a subscriber. Thank you in anticipation of your understanding and cooperation. Would like to learn more about crops grown in america. What are optional if any composting materials ? I have access to some very aged mulch product … tree bark that seems it would work great ? New area for us … just learning .